Time for a timeless flashback… Topic? Children versus adventure. Children versus carefree, fiesta marriage lifestyle. Children versus spontaneous travel. Remember this riff? In The Juggle, WSJ.com blog about “choices and tradeoffs people make as they juggle work and family” John J. Edwards III waxed nostalgic for the early days of marriage before he had children. He refers to a story posted at DINKlife.com by a woman who has endured countless painful experiences due to her childfree choice. The author wraps up with a palpable yearning for the days when he and his bride could zip off to Umbria, Italy like his childfree colleagues at work, but is quick to admit that his suburban social bubble is kid central with nary a childfree couple in the mix. How will you answer the big question? Or will you ask the bigger question: Children or no children? Travel for Couples Without Kids? Back in early 2011, my husband and I started a social networking group in Boston called Couples Without Kids (our friends with children “affectionately” referred to the group as “Couples Who Hate Kids”). We actually really like (some) children but had determined that we did not want them for ourselves. As we were getting into our 30’s and 40’s, we found that it was becoming increasingly difficult to find other couples who didn’t have children. Our concept for the meetup group was that it would be a social networking group only – not a support group. We weren’t looking to have intimate discussions about our reasons for being childfree, we just wanted to meet some nice people who could go out for drinks or meet for dinner on a moment’s notice. How tired are you of making plans 3 months in advance only to have it cancelled because Billy’s got the Hershey squirts? We like being able to call a CWK couple at 7 because we need a replacement at 8 for our trivia contest at the local bar (and we all know trivia + cocktails = fun). Over the course of the past year, we’ve met many wonderful couples without kids and found one common interest (among many) was the love of traveling. I’ve traveled extensively throughout the US, Canada, Mexico, the Caribbean, Europe and beyond. Therefore, early in 2012, I partnered with Travel Concepts, a well-established American Express Travel company, to launch a new business called “Couples Without Kids Trips”. The concept is to offer unique, personalized experiences for childfree adults. We offer two kinds of services – Organized Group Trips for childfree couples as well as Personalized Trips for childfree couples and adults (small groups, singles, honeymooners and “empty nesters”). Instead of “family-friendly” destinations, we are specialists in adult-only vacations and finding destinations and excursions which cater to childfree adults. A client recently asked me about the possibility of scheduling them on a childfree flight. Although we can’t make miracles like this happen (yet), we do our best to cater to our childfree travelers. For a humorous look at childfree travel, check out this video from DINKLife. 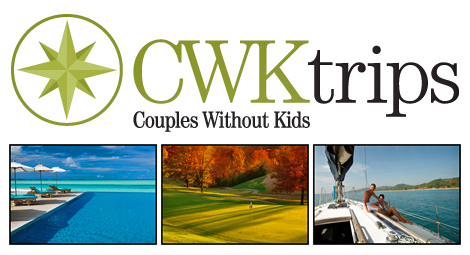 For more information about CWK Trips, please visit our website at www.coupleswithoutkidstrips.com. If you “like” us on Facebook, you’ll receive updates about upcoming trips and promotions. Childfree Trend on the Rise: Four Reasons Why! Looking to escape the cold AND the kids over the holidays? Ho’oilo House is designed as an adults only property. We do allow children over 16, but they will be in their own room in accordance with our 2 person per room maximum. Exceptions can be made for small babies. Ladera – Beware children are welcome over the holidays! Ladera was designed primarily as a retreat for adults. Because of its unique location overlooking the Caribbean and the Pitons, there are steep drop-offs at the edge of every suite. Furthermore, many guests come to Ladera to get away from their children – for the romantic setting and peaceful solitude Ladera offers. If you do bring your children, please keep a constant eye on them, especially around the cliff areas and on the stairways, and be sure they understand that peace and quiet are important to many of the guests at the resort. Children over the age of 10 are welcome. Families with children ages 5 and up are welcome during the holidays. WNKies – Tell us your favorite secret childfree getaway. Kids and parents of 2011 are busy and exhausted all summer long. There are tutors and classes and camps and play dates and so many things that fill up the space that is meant for restoration and relaxation. Even as a member of the child-free community I am guilty of playing catch up with work and to-do lists on splendid summer days when I should be outside playing! As a kid, my summers were crammed with summer camps and activities like many kids today. The days that I wasn’t programmed to the gills I was thrilled to lie around and stare at the TV, or go for meandering bike rides, or make chalk drawings that filled the sidewalks. I loved the freedom that came with having nothing to do. I would maybe wander home when the street lights came on for a quick dinner only to rush back out to meet the neighborhood kids for the late night kick-the-can session. As a former teacher I can smell the first day of school rapidly approaching and still get excited to see new notebooks filling the store shelves at the end of July. September is always a crazy rush to get back on task with school and work, so why do we all feel the need to keep a tightly packed schedule during the summer too? Maybe next summer parents, kids, and even the child-free can remember that the lazy days of summer are fleeting and it’s okay to enjoy the warm summer breeze and the long lazy days and just…relax. Do you feel rested after summer vacation or are you eagerly awaiting the first day of school so you can finally get some rest?